Friends University’s dedicated and experienced staff understands the many challenges facing today’s military members and their families. Whether you are preparing for a civilian career, seeking to advance your military rank or professional development, we offer several degree programs that are needed for most occupational specialties. Submit an official copy of your Community College of the Air Force (CCAF) transcript for evaluation of credit and we’ll apply this towards your bachelor’s degree. Friends University wants to give you credit for knowledge you have learned outside the traditional classroom. DSST/DANTES test scores will be evaluated by our Registrar’s Office and we will post any credits as transfer work. Please contact the Registrar at 316-295-5400. To show our appreciation of your service, Friends University is pleased to waive the application fee for all active-duty military service members and veterans. 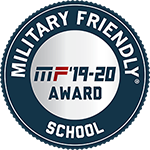 Friends University is pleased to participate in the Department of Defense (DoD) Tuition Assistance (TA) program and we have signed the MOU conveying the commitments and agreements made with the DoD so that active duty, guard and reserve members may use TA funds to pay for tuition at our university. Currently, TA is only available for our adult cyber security bachelor’s degree program. Each branch of service has different systems for applying for TA. Please check with your Education Office prior to the start of the term to ensure you have complied with their requirements. You must be enrolled in a Friends University course through our online enrollment system before you apply for TA. KBOR – Kansas National Guard –If you are actively serving in the Army National Guard you may request Tuition Assistance by following the steps on the National Guard website (https://www.nationalguard.com/education?cid=cid=ksgeneralpage_txt-generalpag30389_web_20160502) or by contacting your Education Services Officer. Army Tuition Assistance – Active duty service members may request Tuition Assistance through GoArmyEd.com or by contacting their Army Education Counselor. NAVY/Coast Guard – Active duty service members may be eligible for Tuition Assistance and should contact their Education Services Officer to learn more. Friends University returns TA funds in compliance with the Federal student aid rules for return of unearned student aid as outlined below in the Repayment of Title IV Funds section. For ALL students, if the student has received funding from Student Federal Assistance (Stafford Loans, PLUS loans, Perkins loans, SEOG or Pell Grant) and withdraws during a period of enrollment or payment period, the amount that has been earned up to that point is determined on a pro-rata basis. If you received less assistance than the amount that you earned, you may be able to receive those additional funds. If you received more assistance than you earned, the excess funds must be returned. The amount of assistance you earned is determined on a pro-rata basis (days completed divided by total days in the period of enrollment). If you completed 30 percent of your period of enrollment, you earn 30 percent of the assistance you were originally scheduled to receive. Once you have completed more than 60 percent of the period of enrollment, you earn all of your assistance. If you are responsible for returning grant funds, you do not have to return the full amount. The law provides that you are not required to return 50 percent of the grant assistance that you received that is your responsibility to repay. Any amount that you do have to return is a grant overpayment, and you must make arrangements with Friends University or the Department of Education to return the funds. Friends University must return the unearned aid for which the school is responsible by repaying funds to the following sources, in the following order, up to the total net amount disbursed from each source: Unsubsidized Stafford Loan, Subsidized Stafford Loan, Perkins Loan, PLUS Loan, Pell Grant, FSEOG and other Title IV programs. Friends University will also verify the regulations for the return with each specific agency. This Repayment Policy does not apply to institutional, state or other non-federal funding sources. Institutional, state or other non-federal funding sources will follow the Friends University Refund Policy. Once the refund calculation for non-federal funds has been calculated, funds will be returned to the following programs and/if necessary to the student in the following order: Unsubsidized Federal Stafford Loan, Subsidized Federal Stafford Loan, Federal Perkins Loan, Federal PLUS Loan, Federal Pell Grant, Federal SEOG Grant, other Title IV program, state, Friends University and the student. Loan (Stafford or Perkins) and TEACH Grant recipients who withdraw are required to have an exit interview before leaving Friends University and should contact the Financial Aid Office. Examples of refund calculations as detailed in this policy are available to students upon request made to the Financial Aid Office.